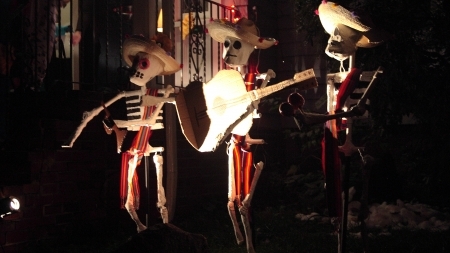 Dia de los Muertos: The Day of the Dead, as celebrated in Mexico and selected Central American countries. We made it come to life with an exploding piñata and dancing skeletons. Just like they have in Mexico. The dancing skeletons idea came from a clever bit of animation Ruth found on the web. With an unlimited schedule and budget, it would have been cool to completely re-animate the video in three dimensional form. Since we are not independently wealthy, we decided to create some moving props to go along with the video itself. 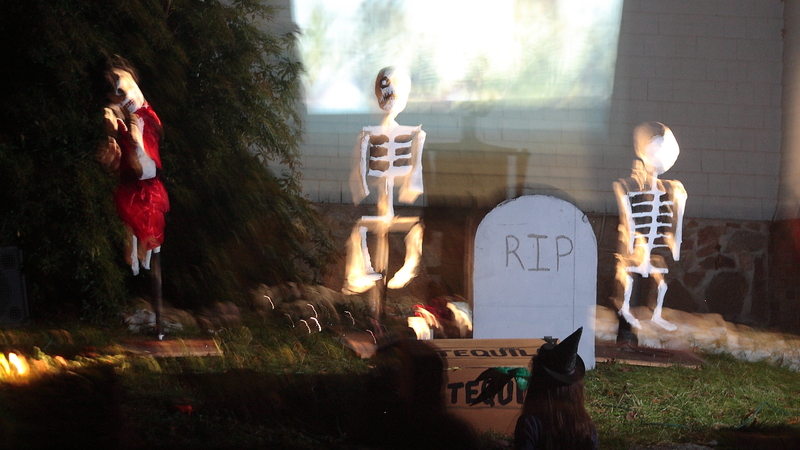 In its final form, the video was cut down to a minute and half and projected on the front of the house while three skeletons got to pogo up and down on pneumatic cylinders. To add a bit of shock value to the presentation, a faux case of tequila was set out front to open and snap shut. Things that amazed us #1: We didn’t see any children get scared by the tequila box, but we scared the crap out of a couple of adults. Maybe the kids expected something to happen. Maybe we just missed seeing it. With the weather being what it was, we really did not expect a big turn-out. Monday morning, Doug went out to shovel the front lawn only to find that it was frozen solid. Setbacks were anticipated, but this was a new one. The snow eventually softened-up to the point that it could be scraped off the grass leaving a wet, almost muddy mess combined with water dripping off the roof. With everything this year being either made out of paper or having 110V running through it, or both, we had some serious concerns. The original plan was to decorate much more fiesta-like. Some of the lighting had to be jettisoned and paper flags remained indoors, but we were able to put down enough plywood to keep things dry. The end result was a bit creepier— fine for Halloween and possibly helpful in integrating our bizarre set-up with our neighbor’s more traditional displays. Things that amazed us #2: Our neighbors confirmed that this was the second most popular theme we’ve used. The first? Giant Floating Eyeballs. No idea why. Giant Floating Eyeballs isn’t even a theme. By late afternoon Ruth was able to firmly plant the papier-mâché skeletons in the ground on PVC pipe. 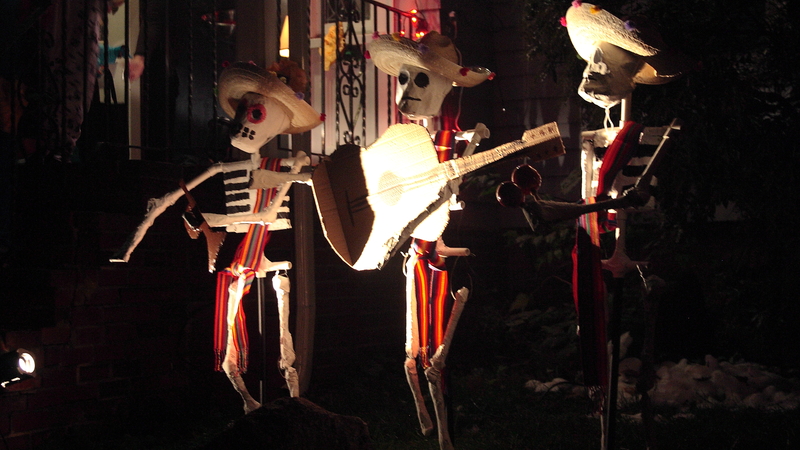 El Burro del Diablo had been hung and the skeletons were dancing along to their music video. 247 kids later we concluded it was the most fun Halloween ever. Watching trick-or-treaters hit the piñata was a blast. Things that amazed us #3: We expected kids to either aggressively pursue hitting the piñata or shy away, but most of the time they were shockingly analytical and courteous to each other. We witnessed a group of eight-year-olds employ “Eeny, meeny, miny, moe” to pseudo randomize the order in which they would get to hit the piñata. They then lined up in their self established order. Bizarre. 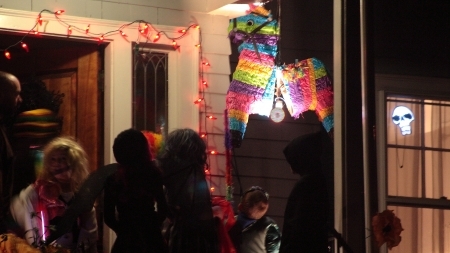 Posted in Halloween and tagged faux tequila, Mexico, piñata, pneumatic, self established order, skeleton, video on November 4, 2011 by Doug. We have been talking about doing a Day of the Dead themed Halloween for years. The imagery of hand-made skeletons, posed and dressed as they were know in their happier (living) days has both a roughness and a soulfulness that New England style Halloween lacks. Indeed, Dia de los Muertos is not about ethereal ghosts and goblins, but literally about the bones of one’s ancestors. 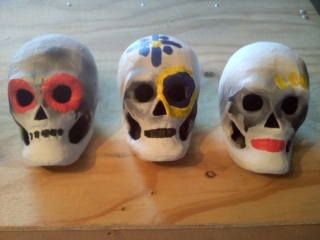 The easy route out would be to make (or buy) a bunch of paper mache skeletons, pose them, and be done with it. Unfortunately there two drawbacks with that: First, no one is impressed by paper mache. It lacks any kind of kinetic quality that people expect and want. (It’s hard to beat a strobe light in a window.) Second, we had a goal of making things more interactive this year. Enter the piñata. What’s more fun than a piñata? Nothing is more fun than a piñata! Once. 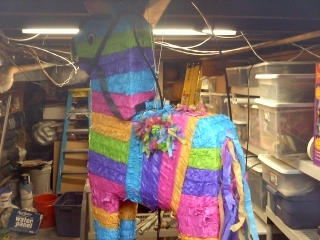 So the question becomes how to resurrect a piñata after it’s been beaten? Our solution is to allow the piñata to break itself in a controlled manner and put itself back together. Cake. Or maybe the real question is what comes out of the piñata? Maybe the payoff is more important than the piñata itself? Philosophical questions aside, there is one thing we do know: It must be a donkey. Any Internet search for a traditional ﻿Mexican piñata reveals either a donkey-shaped piñata or a star-shaped thing that would be hard to work with. The donkey is basically a box with legs and a head. 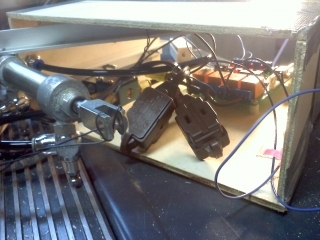 Remember kids: When automating anything, your ideal model is a box with legs and a head. The game plan is to cut the piñata in half, hinge it at the top, and make the thing open and close whenever someone hits it. We’ll use a security vibration detector to determine when the donkey has been slapped. 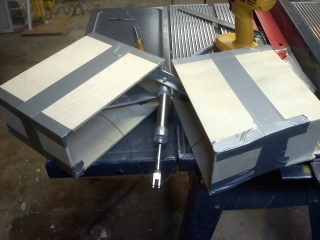 Since the piñata is made to be destroyed, the first step is to make an inner structure out of plywood. Note the use of duct-tape: Crucial in any design where resiliency is a must. The hinge is constructed from two aluminum bars. At the center of each bar is a pivot point that carries a box on either side of the pivot. A pneumatic cylinder is hung from the hinge and a wire connects the shaft to each free end of the bar. As the shaft extends from the cylinder, the wires are pulled down (or the hinge is pushed up if you want to get complicated); thus, causing the bars to move at the pivot point. The bars push the boxes and the boxes separate. To make the magic work, we programmed a PIC IO board to sequence the opening of the box, triggering of effects, and subsequent closing of the box. This year we got smart and wrote some firmware that allows us to change the sequence without having to reprogram the board. Source code available upon request. 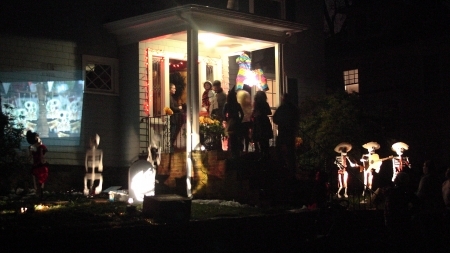 Posted in Halloween and tagged donkey, firecrackers, piñata, resurrection on October 25, 2011 by Doug.